Happy Little Bento: Posole II Bento in LunchBots Thermal Jar: Review and Giveaway! Posole II Bento in LunchBots Thermal Jar: Review and Giveaway! 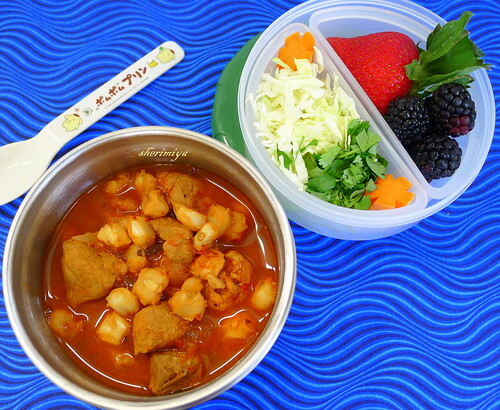 Posole II Bento in LunchBots Thermal Jar, a photo by sherimiya ♥ on Flickr. NOTE: This giveaway is now CLOSED. Thank you for your interest! Remember the posole bento I made almost exactly a month ago? It was my first time making this spicy Mexican chili-based pork and hominy soup at home, although I've enjoyed it in restaurants for years. This bento marks my second attempt, this time using real homemade red chile sauce from scratch! I used New Mexico chiles, as per Homesick Texan's recipe here. It came out quite tasty! I adapted the recipe a bit. In a large pot, cook the onion in olive oil for 10 minutes. Add the pork and brown on each side for a couple of minutes. Throw in the garlic and cook for one more minute. Pour the broth into the pot and add the oregano, cumin, ground cloves and ancho-chile powder. Bring to a boil and then turn down to a low simmer. Meanwhile, take your New Mexican chiles and cook on high in a dry cast-iron skillet until they pop, a couple of minutes. 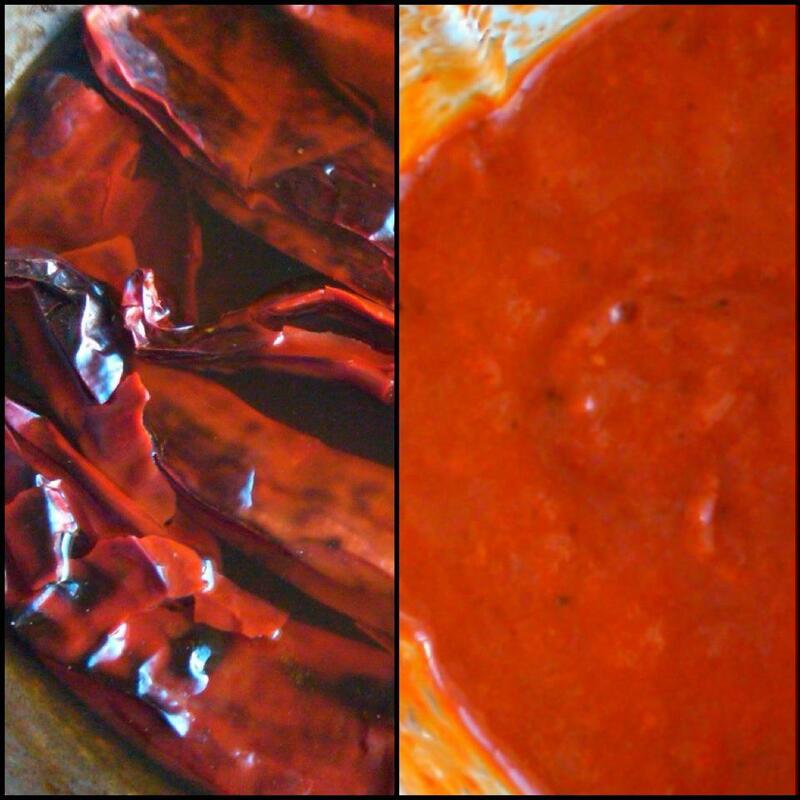 Turn off the heat, add water to the skillet and let the chiles soak until hydrated, about half an hour. Pour into bowls and serve with shredded cabbage, diced onions, lime wedges, chopped cilantro, and avocado slices. I didn't take any good pictures, but I did snap a few with my phone. Next time I'll take process pictures for sure. It was fun making the sauce, and easier than I expected. 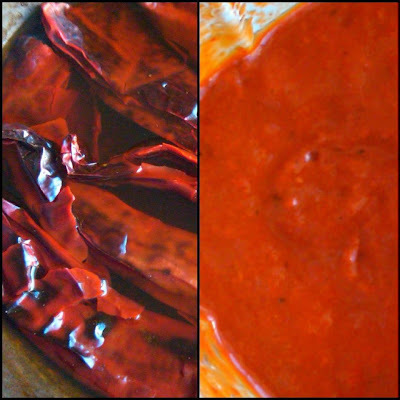 Next time I plan to use guajillo chile pods, the traditional chile used for Mexican sauces. I also plan to double the number of chiles for a spicier broth. Anyway, this batch was excellent. I used a different cut of pork, which turned out to be leaner than the pork shoulder I used last time. Note: pork shoulder is best. I sent this posole to school with TinySprite in my new LunchBots Thermal Food Jar, which they were gracious enough to allow me to try out and review. I was so excited, because in the cold months I use a thermal food jar several times a week. I'm always on the lookout for a better one. I sent this one along with a side box of shredded cabbage and cilantro, and some decorative carrots for her to add to the hot soup at lunchtime. There are also some blackberries and a juicy strawberry. So what did I think of this jar? I've actually used it several times already, and you'll see those bento during the rest of the week -- so I've had some time to think about the merits and shortcomings of this jar. - At 16 oz, it's larger than the Thermos brand Hello Kitty thermal jar and similar jars available for the kid set. This is nice because there are times when my nearly kindergarten-age girl could eat a little more than the 9 oz of the Thermos. - Even though it's quite a bit bigger, it's not much heavier. I also have the Stanley 17 oz jar, which I use for my 3rd-grade boy, and that one would be too heavy for her to handle. - All surfaces which come into contact with food are stainless steel, including the inside of the lid. This is a nice feature for those who are concerned with heat effects of plastic in contact with food. I have not seen this feature on any other thermal food jars. - The wide mouth opening makes it easy for her to eat from, similar to a bowl. - The stickers on the jar and lid make it easy to know how tight to screw on the lid so that the vacuum seal won't be too great to open it again. - The wider screw top lid, while convenient to eat from, may be unwieldy for a smaller child with a smaller grip. My 3rd-grader could manage it with no problem but my preschooler needed help opening it. Of course, a teacher should always be nearby to help with this. - I've found greater heat loss through this jar than from the Stanley jar, but may be similar to what I see with the Thermos brand jars. I didn't do a side-by-side comparison, but I measured the temperature of boiled water packed into the jar after several hours on the counter. After 4 hours, which is about the longest that my daughter waits before eating her lunch, the temperature was not piping hot. This is not necessarily a problem: she reported to me that the food was still warm and delicious. In conclusion, I think this thermal jar is worth purchasing, if you are in the market for a versatile jar useful for either a child or adult. As I mentioned, it is unique in its shape and capacity, and those in themselves are good reasons to invest. It does a good job of keeping your soup or stew warm, and with no leakage through the gasket seal. Big enough for a healthy appetite but lightweight enough for a smaller child to handle, you could use this jar for kids (or adults) of any age. But even better than purchasing this jar would be winning it in a giveaway! That's right - the kind folks at LunchBots were generous enough to provide a LunchBot of your choice to one of my readers. All I'd like you to do is tell me which LunchBot you'd prefer, and what you'd pack in yours. If you haven't noticed, I own quite a few of them (Uno, Duo, Trio and now Thermal Jar), so I'd be interested in hearing your suggestions! And tune in tomorrow because I've got a review of another cool LunchBot product coming up! Please comment with your name and email address, telling me which LunchBot you'd choose AND what you'd pack inside. The winner can pick any one LunchBot food container or insulated container of their choice. Contest entries must be received before Friday March 16th, 2012, 5pm Pacific. 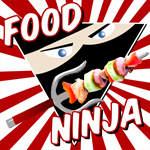 Oh, and if that isn't enough, use the coupon code HAPPYBENTO for 10% off and free shipping at LunchBots.com all week! Woo! BTW, Is that plastic container part of it too? or you packed some fruit and veggies separately? Thanks!! Great giveaway! I'd choose the Thermal Pink for days when I'm not planning to be around a microwave at lunch time. :) I'd love to pack my favorite vegetarian chili made with sweet potatoes and black beans. I've been eyeing LunchBots for ages, but have not taken the dive. Like Sara, I would choose the Thermal Pink for my Kindergartener. She loves Chinese rice porridge stewed with carrots, celery, and onion, mixed with some dried pork sung right before eating. The thermal jar would be the perfect way to allow her to bring it for lunch! I would love to have one of the trio or quad containers, my kids love to dip anything and everything in hummus, so those would be perfect for that when they start preschool in the fall!! Thanks for a great giveaways! My toddler son is getting ready to go to preschool and the thermal blue container would be perfect for his favorite miso soup (full of veggies and tofu) or even curry. I love your posts! I would choose the Trio Blue, as I'm "responsible" for my husband's lunch everyday (he would just forget to eat, otherwise). He isn't a big eater as he doesn't have a designated lunch hour and so I try to pack a variety of foods that he can snack on all day, like lots of veggies with hummus or tzatziki, and roasted chickpeas. The Trio would be perfect for that. I've never purchased anything like a LunchBot container before, but I attend class and work the majority of my days during the week. I don't have time between classes to go home and cook anything, so having a container that is both very convenient and aesthetically pleasing would be a huge plus! Sometimes I don't take the time to pack a lunch, and I no it isn't very healthy to go all day without eating anything. I think I need to get some type of bento box or something that would make me want to pack my lunch just so I can show off the container. I think that I would prefer the Trio because I don't like different types of foods to be touching one another (I'm obsessive compulsive) so the Trio would work nicely for me because I could have three separate sections to put my food in. I've been teaching myself how to roll sushi, so I would definitely be putting some in the Trio if I had one. I'm also trying to eat more healthy overall, so I might have one section hold the sushi, one section hold some cottage cheese, and the third section I would use for fruits or veggies. I think the longer section would be perfect for the sushi! I like to make lunches for my little sister, and I already have a couple bento boxes which are great for regular foods, but if you try to pack anything with a sauce it'll leak out. My little sister absolutely adores curry, chili, soup, and stew, so the dark blue thermal would be perfect! Forgot to mention what I'd love to pack in the thermal lunchbot, I'll pack my kids some home-made soups and stews, which I often made because living in the pacific north west we only get a couple of months of summer :P and also my boys love to go skiing during the ski seasons so having thermal lunchbot would be awesome!! 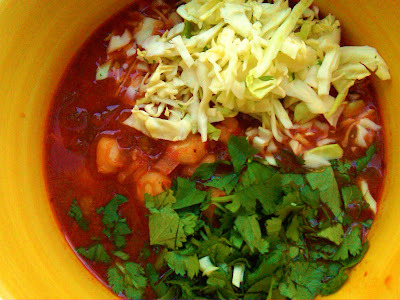 Gorgeously flavorful homemade posole! Inspiring :) Good news--we have a contract on our house, can't wait to explore Mexican cuisine once we come out to Cali! I would pick the Trio Blue. It is perfect for the small servings of fruit and veggies that my little one needs! It's a hard pick, I adore the Trio Blue but I'm also trying to get my daughter to eat more warm, soupy foods so the Thermal Green would be awesome. The only soup success we had so far was a yummy tomato soup with dumplings, but hopefully she would be willing to eat a veggie stew if I match it with fun crackers and cute fruits. I'd want the insulated container because my boyfriend has recently been talking about wanting to take homemade soup with him to work, because canned soup has such high levels of sodium. So we've been looking for a good way for him to take it. The trio so I could do separate out my BooBoo Bears Mochiko chicken (that we are loving), with baked sweet potato fries, and mandarin orange slices. Hi My name is Kathleen Lambert, my email address is purplelemonpie@hotmail.com. I love the Lime Green Quad Lunch Bots. I love the 4 separate compartments. That would make it super easy to pack a meal of fruit salad, onigiri, marinated meat, and mixed vegetables. I could also use this for snacks, mixed nuts, fresh fruit, homemade pudding, and a homemade mini muffin. The possibilities are endless. Maybe a snack bento with peanut butter, celery sticks, pretzel sticks, and trail mix. YUM. I'd put some tasty rice and curry in the LunchBots pink thermal! I would choose the lunchbots insulated thermal green. I don't own any insulated containers so this one would be great! I could pack anything like soup or chili to say warm. Or fruit to stay cool. My name is Stacey and my email is shannon99709@yahoo.com. I'd love to win a Trio for my sons lunches. He loves to pack a variety of little things so the dividers are perfect for him. Pasta salads, deviled eggs of all favors, mini sandwiches, and anything skewered on a stick. I would get the Thermal Green Jar. I would love to send warm homemade chicken nuggets or soup. I don't yet have any kind of thermal container. Your soup looks delicious! Id Choose the Quad Sky Blue and pack lots of healthy fruits and veggies in fun shapes for one of my kids...of course, they would have to fight over it, or I would have to purchase 3 more, lol!!! how cool! i would love to own the trio red! definitely would pack it with some berries in one section, cooked peppers and onions in the other, and chicken with rice for the larger one! hard to choose with them being all so cute! i would choose the dark blue thermal jar, to keep my food warm while i'm working until lunch. probably some beef stroganoff or this awesome soup my mom makes me when i'm home. mmmm, momfood. Very nice review! I would love the lunchbots duo for my little girl who is starting preschool in a few months! I found your blog because I was looking for cute and nutritious ideas for her lunches! Fruits, little sandwiches and other goodies would be great inside. Thanks for the giveaway! My husband would love your posole! I would love a Lunchbots! I would choose the Quad, for my 10 year old boy's lunches. He has one stainless lunchbox and that is all he wants to take these days. He used to prefer his Lock & Lock 4 square because he likes the 4 divided boxes but he prefers the stainless lunchbox now. He says it never smells funny :) I would pack him raisins and nuts, a checkered apple, a mini oatmeal muffin, and ham roll-ups. Thank you for the chance! i think the red trio would be great to try. i like that it has a few different compartments to keep fruit, veggies and rice seperate. Delicious post and awesome givaway! I'd love to add the Trio, all stainless box. It would be the perfect box to round out my collection! Posted before I added my name and E-mail!My name is Rebecca and My email is rebeccamartin74@gmail.com Delicious post and awesome giveaway! I'd pick the trio to round out my collection! I would love to try the all-stainless quad. We have the yellow pico, but I'm afraid it won't keep up with my preschooler's appetite much longer! Thanks for doing the giveaway! You make beautiful lunches. I am officially infatuated with the new Quad, although I do not own any of the other LunchBots at this time. I would definitely pack it with some yummies - broccoli salad, fresh seasonal fruit, some quinoa stir fry, and for the fourth section, a piece of my low-sugar banana cake! Great giveaway! I am webetinners AT yahoo (dot) com. I'd pick the Thermal Pink insulated container if I won for sending soup and chilli to school for mu daughter. Hi!~ I'm Rini and owning the green insulated LunchBot would be fabulous! Even though the warm season is starting to kick in, I still love to cook salmon congee, tortilla soup/stew, and potato soup for dinner, so it would be great to be able to bring those leftovers for lunch instead of having to buy some fastfood at the student union or bring an unappetizing sandwich! I've tried loading the soups and congee into my regular thermos that I use to drink tea, but everything got stuck to the sides and my spoon was too fat to scrape things out! Awesome giveaway! Like reading your blog! I'd love a thermal pink for my little girl and put the chicken & vegetable soup in it. I think it's great for her to bring to kindergarten. Hi my name is Nicole and I've been watching your bento posts for a long time now. I've been very inspired and I love hearing about TinySprite and MisterMan. They're adorable really. If I were to choose, I would probably have to go with the Blue Trio. I don't have a metal bento box and I've always wondered how they would do. I love the three sections since I'm a college student and can eat a bit more of one dish than a child. But I really love the separation because most of my bento do not have them and they are really a great idea! Thank you for holding such a nice contest! It's really considerate of you. I'm completely new to bento boxes and don't have a single one, but really would like to give it a try. I think I would get the quad in either green or blue. I already have Uno, Duo, Pico, and Eco so I'd probably want the Quad or Trio to round out the collection. I would try to pack some sort of deconstructed taco in either so I'd have fun assembling my lunch. Although the Thermal looks like it'd be a good one for those cold winter days (which seem to have left us over here on the East Coast). I would definitely try packing soup or chilli in the Thermal. Mmm mm mm! I think I'm too late already but just wanted to drop by. :-) The chile looks so delicious. I'm always reluctant to make chiles as I'm afraid my kids may not eat it but I'm a big fan of chiles! The lunchbots sounds good. I need to find all about lunchbox before next school year starts. So much to catch up and learn from you!